Families, Alumni, & Friends of MOH Camp are invited for a day of fun & sun! Bring a picnic lunch and spend the day relaxing by the beachfront as well as taking part in family games and activities.. 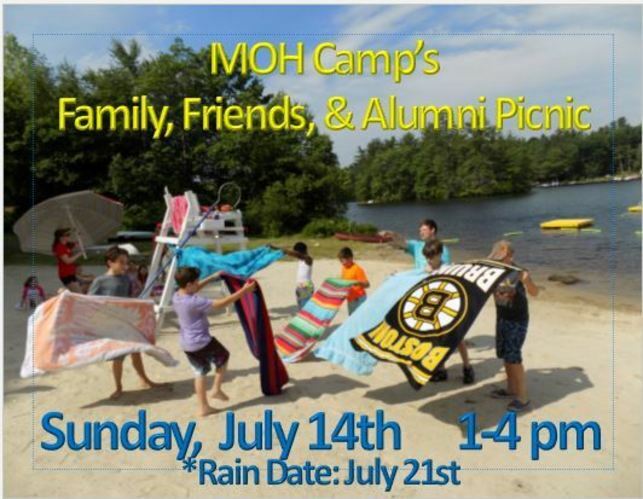 Please let us know if your family plans on attending MOH Camp&apos;s Family, Friends & Alumni Picnic on Sunday, July 14th. Yes, my family plans on attending! Please let us know the number of people attending in your group. REQUIRED 1 2 3 4 5 more than 5 Please fill out this field.